(Those were from "The Thinker as Poet" and the page in the photograph is near the beginning of "The Origin of the Work of Art") It's been awhile since I've read Heidegger. I have to be in the proper mood, and alert, because most of the time it takes me awhile to ponder what he's suggesting in some sentences, let alone a paragraph or entire essay. 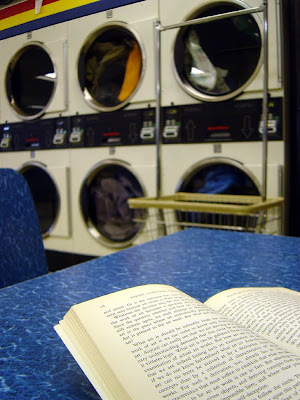 But, these are good things to think about, and it's fun to ride the loop de loops of his arguments and ponder our Being, even at the laundromat. "To this end it is necessary that we should know with sufficient clarity what a thing is."